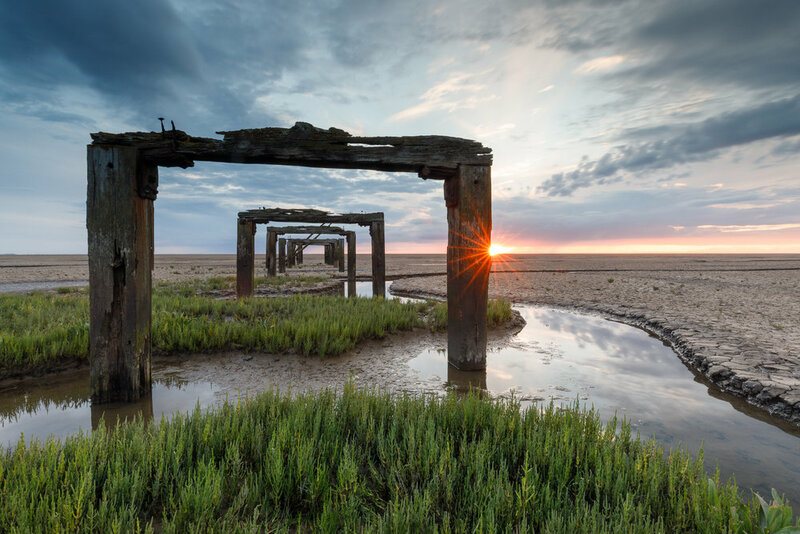 Sunset on the Norfolk coast, Canon 5D mkIV, 16-35mm @ 16mm, 5sec, f22, ISO 100, Lee 0.9 reverse ND grad and Little stopper 0.9 Reverse ND grad and landscape circular polariser filters. We all love a sunrise, well at least those of us out of bed early enough to see one, but If you've ever tried photographing a sunrise (or sunset for that matter) you'll be aware of how challenging it can be. The sun and sky are extremely bright, everything else rather dark and that range of contrast is usually way too high for our cameras to capture in a single shot. Using a graduated neutral density (ND) filter is the best way to cope with this high contrast in camera and Lee filters have created a new range of reverse ND graduated filters, designed for exactly such a task. Lee aren't the first to produce a reverse grad but their version has been much anticipated and I've been lucky enough to get my hands on a couple of them to test. First of all, let's back up a bit, what exactly is a reverse ND grad? It's going to be far easier to show you than describe what a reverse grad is, a picture is worth a thousand words and all that. The image below shows a Lee 0.9 (3 stop) hard ND grad on the left and the new 0.9 reverse ND grad on the right, both made of resin. As you'd expect (I'm assuming here that you are familiar with using graduated filters, if not I'd suggest reading this first), the hard ND grad on the left is dark at the top and clear on the bottom with a 'hard' transition between the two, hence the name. The filter on the right has a very similar transition between the clear and tinted parts, but the tint also fades smoothlyfrom the dark area in the middle back up to the top. This dark area in the middle is key to the reverse grad. When photographing a sunrise or sunset, the brightest part of the image is usually on the horizon, where the sun is, and this is where you need the darkest part of the filter. As you move away from the horizon, the sky often gets a bit darker and thus needs less filtration and when this is the case, using a hard ND grad that is dark enough to hold back the bright light on the horizon can make the top area of the sky look unnaturally dark. Again, this is far easier to illustrate with an image and the image above is a good example... The sun had just risen and was getting brighter by the minute so a 0.9 graduated filter was needed to prevent the bright areas from blowing out, but that same 0.9 grad would be too dark for the area of blue sky towards the top of the frame which is nowhere near as bright. With it's darker band only in the middle a 0.9 reverse grad has kept the whole scene looking natural. So how do the Lee reverse ND grads perform? Having not been totally happy with reverse grads I'd tried in the past, either due to their neutrality (or lack of) or the smoothness of the blend of the reverse grad (or 'transition zone' as Lee describe it), I was hoping that these would be an improvement and they didn't disappoint on either front. With my new 0.9 and 1.2 reverse grads tucked safely in my filter pouch and full of anticipation to try them out, what became apparent pretty quickly, thanks largely to the weather, was how specialised these filters are. They are designed for a certain type of image taken in certain conditions, at certain times of day. Typically (and landscape photographers will know where this is going), the British weather wasn't about to provide those conditions when I needed them and the filters languished in my bag for several trips before the Norfolk coast finally came up with the goods and I made the images above. As time passed and I used the reverse grads more frequently, I started thinking about how often I use each type of filter and realised that in fact most filters are quite specific in their uses: Soft grads work well for mountainous landscapes, hard grads for seascapes etc., so these were really no different, maybe slightly more specialised than some but then with the type of landscapes I usually shoot, had I been testing soft grads, I would probably have been waiting even longer for the chance to use them! 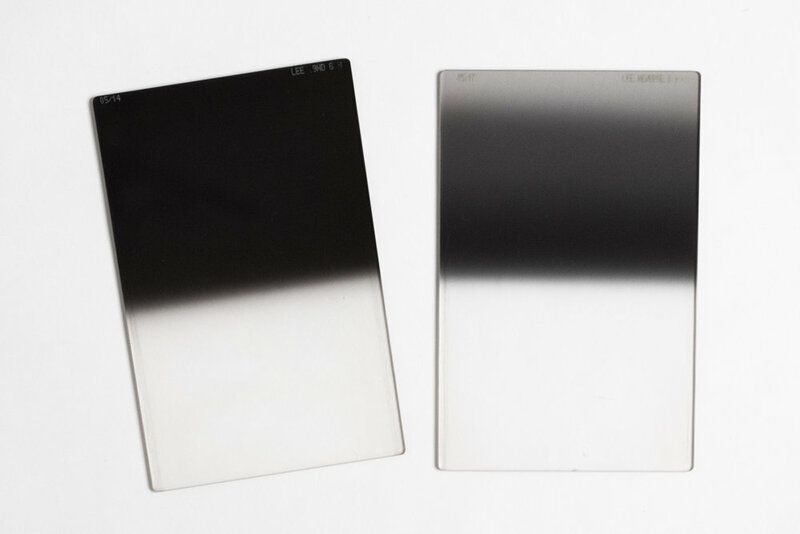 If you have used any of Lee Filters' ND grads before, you'll know that they are neutral with no discernible colour cast, even when stacking more than one filter and these filters are of the same high standard. I should mentioned at this point that my reviews aren't at all scientific, no lab tests or pixel peeping is involved, they are just my opinions based on how things perform in the field. So, my conclusion that the filters are neutral is based on nothing more than how natural the colours look in Adobe Lightroom and on paper... and in that respect I have no complaints. The transition zone on the reverse grads is very gentle and as a result appears seamless in the images, remarkable when you consider that they are hand made. I did find however that because the transition uses the whole top half of the filter, they are probably most effective when the sky takes up a good part of the image. It's also worth noting that to take full advantage of the transition zone you need to use a wide angle lens, Lee recommend using them on 24mm or wider on full frame (or the equivalent). As the graduation between the clear and tinted areas on these filters is fairly hard, I found them to be most effective with clear horizons so they are ideal for coastal photography, especially here in the east of England which is known for it's endless horizons and big sunrise skies. In use the filters are much the same as a hard grad, the graduation is clearly visible so positioning it along the horizon is fairly easy but care must be taken to avoid either pulling it down too far and darkening the horizon or worse, not pulling it down far enough and creating a bright line above the horizon. Having been using these filters for a few months now, I really can't fault them, occasionally I would have liked the transition zone to have been a bit smaller but that's a minor thing and when used in the conditions they were designed for they perform admirably. Even when the light is a little more even and the contrast range less extreme like in the image below, the reverse grad has still proved useful for keeping the exposure balanced, in fact they have become my favourite filter for coastal sunrises and will be keeping their place in my filter wallet.